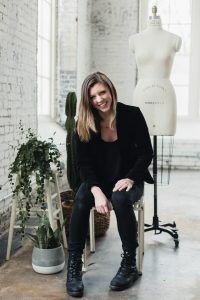 We sat down with Louisville-based bridal designer Elizabeth Crum to learn more about her custom wedding dresses. 21c: How did you get your start? EC: After attending Fashion School in Chicago, I knew I wanted to specialize in women’s wear. During my senior year, my sister got engaged and I made her a dress as my wedding gift to her. I never really considered doing bridal before, but after I made her dress, everything changed. It was the most romantic, magical, experience. There’s so much history and personality in a wedding dress and having it custom made for you means that you’re able to get exactly what you want and feel like yourself, instead of feeling like someone else. It was really cool to provide that for her and to give her exactly what she imagined while maintaining my design aesthetic. From there, I began making dresses for my friends and for their friends and the business took off. 21c: How do you begin the design process? EC: I recently just developed silhouettes, so brides now have something they can try on and a place to start from. 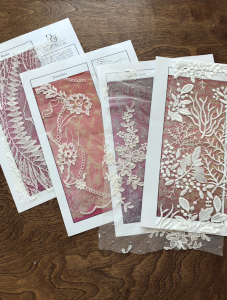 I noticed that sometimes brides were really thrilled with the idea of starting from scratch, but other times people wanted a tangible experience. There’s something to be said about being able to move with the dress and get an idea of how it will look when it’s finished. Some weddings are so much about the venue that that really inspires the dress. Other times, it’s more inspired by my client’s personal taste and fabrics. 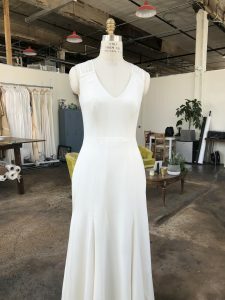 Right now, I have a bride who is a yoga instructor and she didn’t want to be bound by boning and wanted the fabric to move with her so the design of the dress reflects that. 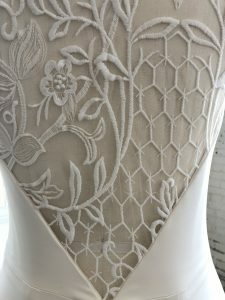 The best part about a custom dress is that it can play into your personal aesthetic— I have a bride who loves honeybees, so we found a lace that has a honeycomb pattern in it. EC: I am really inspired by Old Hollywood and dresses from film. The King and I, Singin’ in the Rain, always stand out in my mind for their dresses. I love modern fashion, but historical and film fashion, particularly silver screen imagery is really inspirational to me. 21c: What’s your advice for brides who are coming to you for their consultation? EC: I love seeing inspiration photos, but I also hope that my brides are open to something new that they may not have thought of before. There’s something beautiful about being surprised at something you didn’t expect. Being able to try on the silhouettes is great because you can play with different looks and see how you feel about it. I also love to find out what people don’t like, just as much as what they do like. That’s a question I also always ask brides. 21c: Although your dresses are all custom, do you see similarities in the brides you work with? 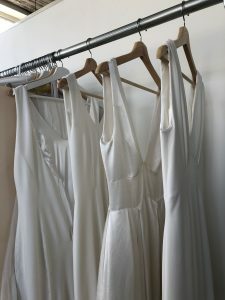 EC: Most of my brides are looking for a modern and relaxed dress. They are also really excited that they’ll be creating a dress that’s perfect for them. Ready to start designing your dream wedding dress? Join us on August 11th in the 21c Louisville Rooftop Apartment for a bespoke fitting and design consultation with Elizabeth. Space is limited, email elizabethcrumdesigns@gmail.com for more information.